Paneer or cottage cheese is a commonly used food item in Indian cooking. I have shared several recipes of paneer in this blog and today I am sharing the recipe of Paneer Manchurian. It is simple and delicious and can be served with fried rice, noodles or chapathi. Boil milk in a pan, add salt and vinegar and stir with a spoon. The milk would get separated from the whey. Allow it to cool down completely and make paneer from this. Do not fry the paneer now. 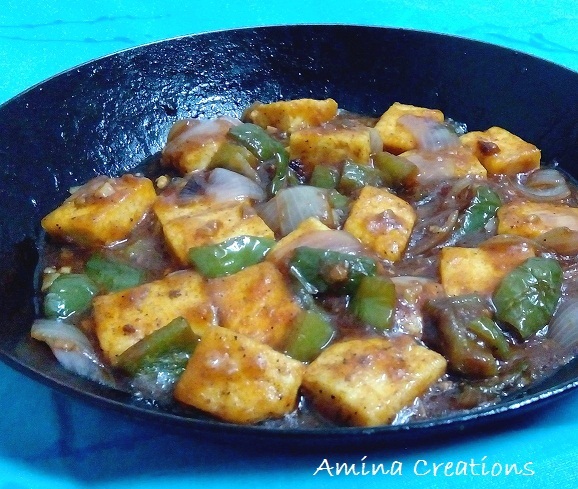 You can check out this post for a detailed explanation and pics on how to make paneer. Now take corn flour, chilli powder, pepper powder and salt in a bowl and mix well. Coat the paneer cubes on all sides with this mix and keep ready. Heat some oil in a non stick pan and shallow fry the paneer cubes till golden in colour. Transfer the fried paneer to a plate and keep ready. Now to prepare the sauce, heat oil in the same non stick pan, add garlic and ginger and saute for a couple of minutes. Add onions and capsicums and saute till they are cooked but have a bite. Add tomato ketchup, soya sauce, chilli powder, salt and pepper powder and mix well. Dissolve corn flour in 1/4 cup water and add to the pan. Cook for a minute till the gravy thickens. Check for taste and add salt, pepper or chilli powder or tomato sauce if necessary.